As some people put it, the stars and planets aligned one day when the late Joseph Kabenek met a fellow engineer during a conference in 1975. They swapped stories and the engineer explained he had been a master surgical instrument maker in Germany for 30 years. He was retired but was repairing instruments for 4 local hospitals. He wanted to fully retire and seeing the background and interest of Mr. Kabanek he offered to train him in surgical instrument repair. After years of training, Joseph & Sandra Kabenek formed ISI in 1978. ISI began with a focus of providing the highest quality sharpening and repair service for hand-held surgical instruments. 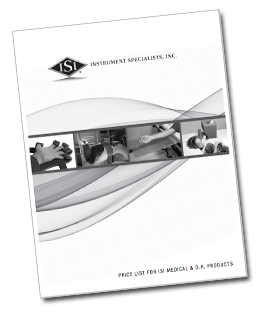 Over the years ISI expanded to offer repairs of flexible and rigid scopes, powered hand-pieces, surgical cameras and more. Since 1978, ISI has been awarded numerous patents for high-quality products and still manufactures them in-house. They include hand immobilizers, surgical hand tables, armboards, traction devices and a full line of surgical instrument cleaners, rust & stain removers, enzymatic products, and lubricants that perform better than higher cost competitors. ISI is also ISO-13485, WBEA, and WOSB Certified. Since 1978 many things have changed in the healthcare industry. For too many companies customer service has taken a back seat to the eagerness to make a sale. ISI, however, believes that customer service is just as important as the products a company offers. ISI strives to make sure those two things never change in our company. To us, it starts with calls answered by ISI personnel and not by an automated operator. It means offering the highest quality products at the lowest possible cost to offering free equipment loaners while yours is being inspected and repaired. So give us a call and rediscover a company that truly puts you first.